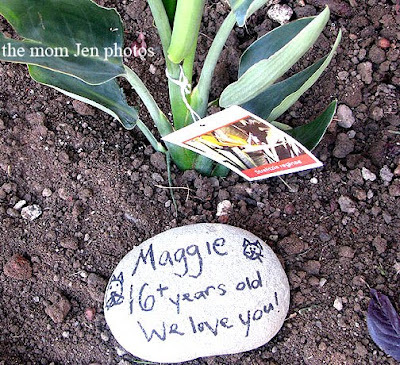 Musings of The Mom Jen: RIP Sweet Maggie. Home > Family, kitty, Maggie, Me, sad things, Things I Love > RIP Sweet Maggie. I have a draft of a post I wanted to write about our kitty, Maggie. I never finished it, and now I'm bummed I didn't. We had to put Maggie down on Thursday, after 16+ years of loyalty. The vet told us she had skin cancer. I couldn't get out of my head that I was killing our beloved cat. People reassured me that I was doing the right thing. Other PERSON made me feel like I was being ruthless and mean. Ahem, you know who you are. I'm still trying to decide, though in my deepest heart I could not bear to watch my kitty get more sick before our eyes. It wasn't fair to her. Originally she was a stray at my parent's house while I was in college. When I graduated, I lived at home with her, at which time her name was "Skinny" and she was not a kitten by any means. When I got engaged and moved into our first cottage in the country, the newly named Maggie came with us. She was always independent. Not the cuddler. Not the come-in-the-house-and-hang cat. The "hey I could use some grub" and "I love you guys, but don't pick me up, I shed alot" kind. That was okay with us. When we moved to our current home, she came along. There were days where we wouldn't see her, an explorer she was. There were days when we were treated to mouse or bird heads on the back porch. That was her way to show her love. I had a drafted post where I was going to talk about her love for hearty leftovers, and she'd turn her nose up to dry cat food. She loved our meatloaf, tri-tip, hamburgers, and tuna. She especially loved milk. This made K giggle, "she's drinking BABA!" She was there at the births of each of my kids. She would come around in the backyard and sit by me when they were babies. When they learned to walk, they'd love to chase Maggie, and she was scared to death of them. Eventually when you could talk to the kids about not being aggressive, she would come around and let them pet her. For a few seconds, then she was done with that. Mags had a million nicknames, Maggie, Mags, Mag, Magnesium, Magdalena, Magaroo, Magalucy, Magma, Magnatite, Magaroni, and she'd always come around with a tap to her food dish or the sound "Quiss Quiss." It's so hard to wake up and not see her on the back step, or on the front porch, or relaxing in the sun on the sidewalk. The kids want a new kitty to name Maggie the Second. We all deal with the reality in our own way. Mine is to be angry and loathe dogs even more. I know that doesn't make sense, but that's me. 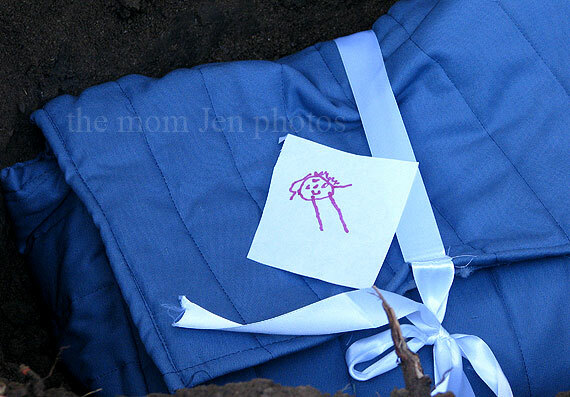 K drew a picture of something she calls "alien cat" to place in the burial spot. I don't know why it's an alien, but maybe that's her way of making sense of all of this. 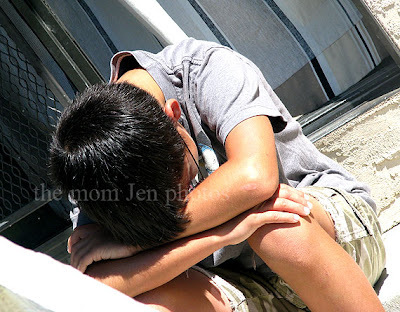 My Boy sobbed and sobbed. Honey, so did I.
Hubby planted a "bird" of paradise plant on top of her. I think that was fitting. DQ made the stone marker, later adding the date. Rest in peace, sweet Mag. You were the best. You will be missed. Sorry to hear of your cat's passing. It is never easy to lose a pet. I am so sorry about the loss of your pet :( It is a hard decision to make. My cat now is named Maggie. I call her Magnadoodle or Fat Maggie (she's chunky) or One-eyed Maggie (she had an eye removed 2 years ago) or if she is being naughty MARGARET! Kitties named Maggie are the best and I am sorry yours is no longer with you. Hugs. Thanks for your words ladies. I'm so sorry for your loss. I've recently had to accept that my 12 yr old husky is gone and man, it's hard. Especially filling up the food bowls at night for the other dogs--seeing his empty kills me everytime. Oh, and my sis has a Maggie and 'Maggalicious' is a frequent nickname! Awww.. what a beautiful post, beautiful picture and grave marker and gesture of planting the plant. As for "alien cat" I might not have understood it either except for the fact that just today, someone on television said something about looking up and seeing heaven and my seven year old said, " You can't SEE heaven! You need a spaceship!!" So maybe alien cat= angel cat? Everytime you commit to loving someone or something, you run the rish of suffering loss. There is always a risk. But not to take the risk? A greater loss. Ali I'm sorry about your Husky! Totally like that explanation of alien cat Jennifer...I love what kids come up with to explain the unexplainable. True Carol....maybe?! maybe down the road. Crying again.... missing my kitty after her being gone a year. God bless you all. Losing a part of your everyday life is hard. Losing a pet can be crushing on your heart. Thanks Ann for your words! Please accept these deep feelings for your loss. Though the path will never be the same, the memories of your time together will be strong. Rest peacefully, sweet Maggie. Oh, Jen. I'm so sorry. It's a terrible loss to lose a pet, and one that had been with you all so long. I'm sorry for your loss. She sounds like a sweetheart. I'm in the middle of trying to figure out why my cat's back legs are failing -- the vet's initial diagnosis (and solution) doesn't seem to be panning out. He's 12, but it seems like he got "old" overnight so I worry.